NETWORK FINALS: THE LAST DAYS OF MICHAEL JACKSON and the YOUNG SHELDON rerun gained 0.1 in final numbers, but the LIFE IN PIECES rerun lost the same. CABLE HIGHLIGHTS: It was TNT’s turn with an NBA PLAYOFFS game at 3.55. On MTV, JERSEY SHORE: FAMILY VACATION dipped 0.04 to 0.98, and EX ON THE BEACH was down a tenth to 0.39. 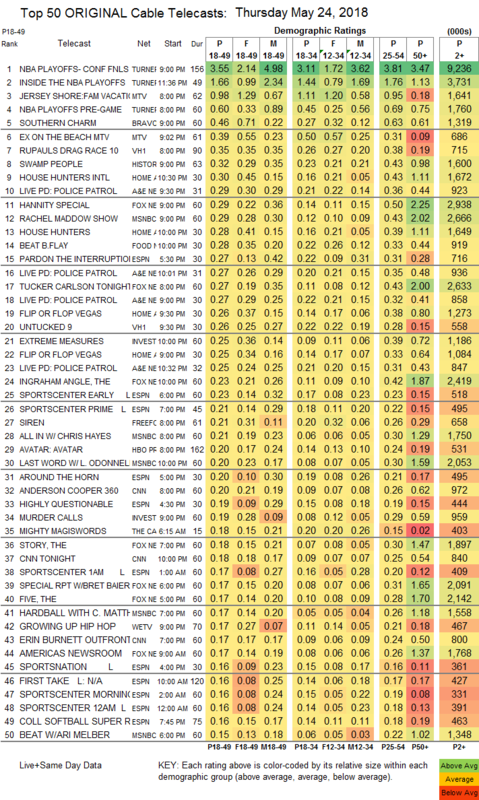 On Bravo, SOUTHERN CHARM was steady at 0.46, and IMPOSTERS was up 0.02 to 0.14. On VH1, RUPAUL’S DRAG RACE gained 0.02 to 0.35, and UNTUCKED was up 0.02 to 0.26. History’s SWAMP PEOPLE ticked up to 0.32. On HGTV, HOUSE HUNTERS INTL rose 0.03 to 0.30, HOUSE HUNTERS was at 0.28/0.28 compared to last week’s 0.25, and FLIP OR FLOP was at 0.26/0.25 compared to 0.24. Fox News’s HANNITY and MSNBC’s RACHEL MADDOW SHOW tied in the 18-49 demo, with HANNITY at 0.29/0.50/2.9M, and MADDOW at 0.29/0.43/2.7M, while CNN’s ANDERSON COOPER 360 was at 0.20/0.26/1M. Food Network’s BEAT BOBBY FLAY returned at 0.28, preceded by CHOPPED GRILL MASTER at 0.25./0.22 On ID, EXTREME MEASURES debuted at 0.25, and MURDER CALLS was down 0.02 to 0.19. The season finale of Freeform’s SIREN ticked up to 0.21. The season premiere of We’s GROWING UP HIP-HOP was at 0.17. Tru’s CARBONARO EFFECT dropped 0.03 to 0.14, and INSIDE CARBONARO ticked down to 0.11. 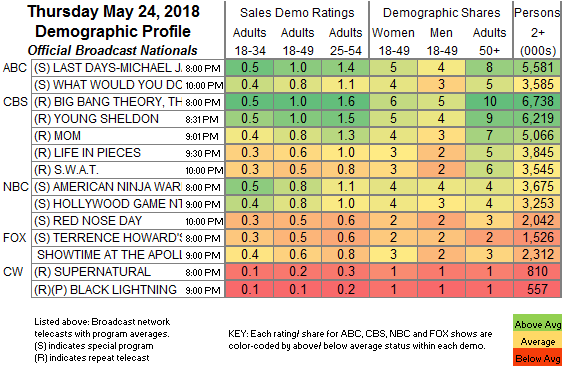 TV Land’s NOBODIES was steady at 0.11. POP’s IMPACT WRESTLING held at 0.07. The buzz about Harvey Weinstein’s arrest didn’t help E!’s CITIZEN ROSE, down 0.01 to 0.05.